1. The failure of the person conducting Business to keep the required records and other information specified in Tax Procedures Law and the Tax Law (10,000) for the first time. (50,000) in case of repetition. 5. The failure of the Registrant to inform the Authority of any circumstance that requires the amendment of the information pertaining to his tax record kept by Authority. (5,000) for the first time. 7. The failure of the person appointed as a Legal Representative for the Taxable Person to file a Tax Return within the specified timeframe. The penalties will be due from the Legal Representative’s own funds. (1,000) for the first time. 8. The failure of the Registrant to submit the Tax Return within the time frame specified in the Tax Law. (1,000) for the first time. - (4%) is due on the seventh day following the deadline for payment, on the amount of tax which is still unpaid. - (1%) daily penalty charged on any amount that is still unpaid one calendar month following the deadline for payment with upper ceiling of (300%). • (3,000) for the first time. - (50%) if the Registrant does not make a voluntary disclosure or he made the voluntary disclosure after being notified of the tax audit and the Authority has started the tax audit process, or after being asked for information relating to the tax audit, whichever takes place first. - (30%) if the Registrant makes the voluntary disclosure after being notified of the tax audit and before the Authority starts the tax audit. - (5%) if the Registrant makes a voluntary disclosure before being notified of the tax audit by the Authority. 2. (50%) of the amount unpaid to the Authority due to the error resulting in a tax benefit for the Person/Taxpayer. 2. Failure to comply with the conditions and procedures related to transfer the Excise Goods from a Designated Zone to another Designated Zone, and the mechanism of processing and storing of such Excise Goods The penalty shall be the higher of AED (50,000) or (50%) of the tax, if any, chargeable in respect of the goods as the result of the violation. 3. Failure by the Taxable Person to provide the Authority with price lists for the Excise Goods produced, imported or sold thereby. (5,000) for the first time. 3. Failure to comply with conditions and procedures related to keeping the Goods in a Designated Zone or moving them to another Designated Zone. 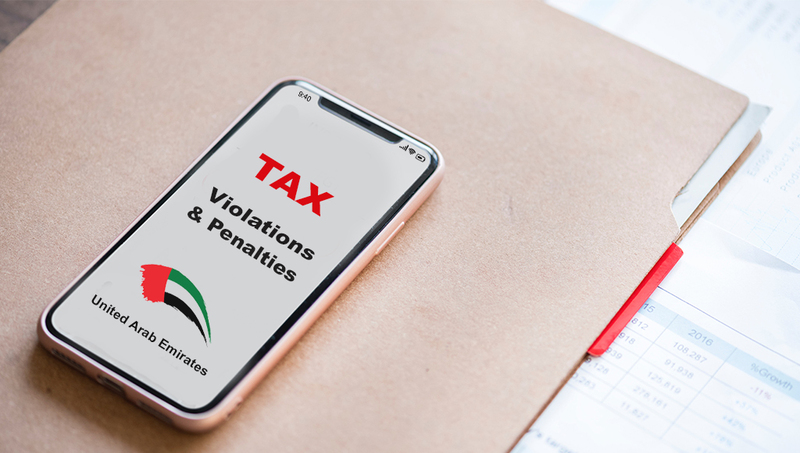 The penalty shall be the higher of AED (50,000) or (50%) of the tax, if any, chargeable in respect of the goods as the result of the violation. 4. Failure by the Taxable Person to issue the Tax invoice or an alternative document when making any supply. (5,000) for each tax invoice or alternative document. We are happy to offer help for your business to submit the VAT returns and all other VAT related matters. Just give us a call now 04 421 3777 and our Vat Advisors & Tax Consultant in Dubai will contact you back.